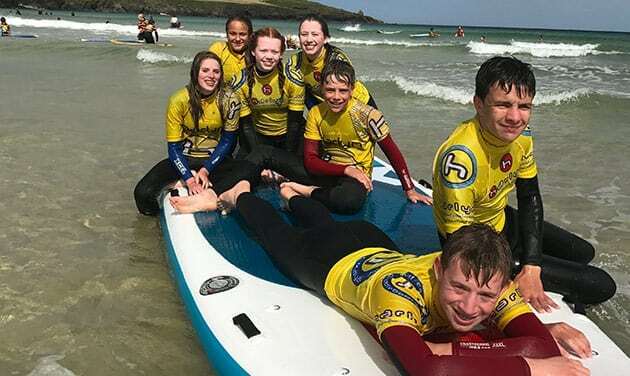 Rest assured you will be getting tuition from one of the most experienced SUP schools in the UK, with over 10 years experience behind us already! Our team consists of SUP Instructor trainers, SUP Adventure holiday experts and SUP enthusiasts with the highest knowledge in the industry. 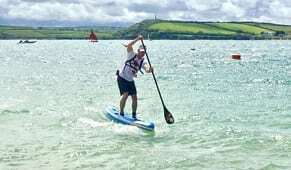 Stand Up Paddleboarding (or SUP as it is widely known) is great fun! 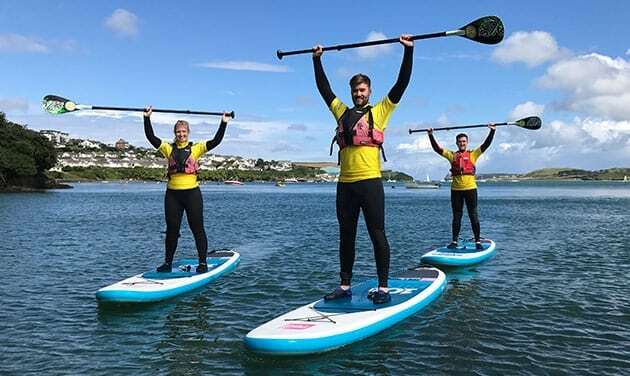 Here at Harlyn, we love trying new activities and are proud to be one of the first companies in the UK to teach SUP having started in 2006. 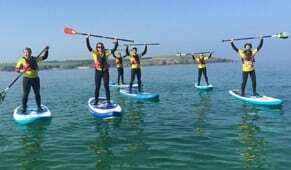 Cornwall is a great place to learn to stand up paddleboard and we have some great locations to take you paddling. 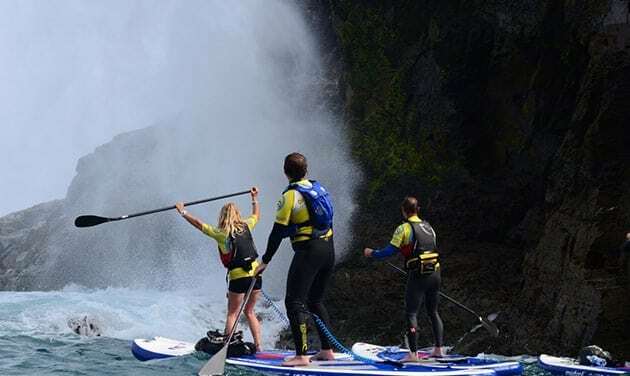 Our intro to Stand Up Paddleboarding lessons will get you started and then you can book on to one of our amazing paddleboarding tours where we can introduce you to some amazing places. 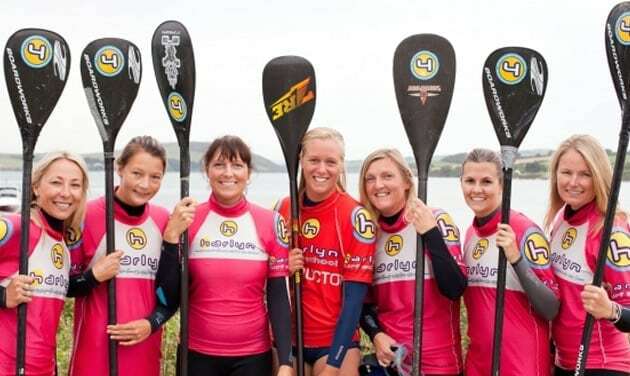 See our SUP FAQ’s. 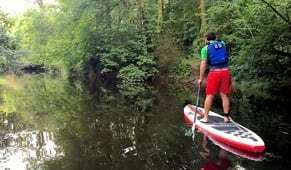 Take a SUP lesson and then discover some amazing locations on our paddleboard tours. Something for everyone from Nepal and Norway to the beautiful Scottish West coast? Join us for an adventure of a lifetime! Check out our Red paddle ISUPp fleet – the worlds most popular SUP board! What level SUP’er am I? We provide quality winter weight wetsuits to keep you nice and toasty out of season and shorties for Summer. 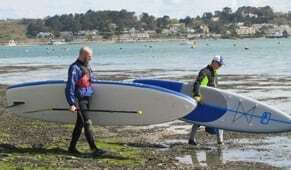 We have an excellent range of SUP boards for all different sizes and ages. Yes you can – we advise wearing a full length wetsuit with a thickness that is appropriate for the time of year. We recommend wearing a 3mm wetsuit only for May – October. You can wear your shorty wetsuit in the Summer months. Because we operate from different locations these details will be provided when you make a booking. How do I book lessons? Do I need to book in advance? We are often teaching during the day and we would love you to book everything using our online booking system if posssible – you will find most, if not all the answers to any questions you have throughout the website FAQ’s and activity pages. Please email us if you have any further question. We do take bookings from our beach base but we highly recommend you book in advance to guarantee availability. All sessions are 2hrs including your safety talk.. We ask that you check in 30 mins before your session start time so we can kit you out. If paddling on one of our adventure tours you may need to allow a minimum of 3hrs. This varies depending on tide times. Please click on the book now link to check on start times and availability. A basic level of fitness is required – if you are happy on and in the water, generally this is enough to have a great time. You should be able to swim a min of 25m unaided. We recommend a min age of 12 yrs old because SUP boards are larger than your average surfboard and challenging for younger to children to move around. Yes of course we have a team of instructors ready and waiting. If you have a group of 8 or more please contact us to check availability. No we don’t. Whilst SUPing in lovely sunshine is preferred you can still have loads of fun in the rain. Often rainy days have provided some of our most memorable sessions! Our cancellation policy is outlined in our terms and conditions. We have an excellent health and safety record. However, if we deem the conditions to be unsuitable on the day then we will try our best to reschedule you or offer a different activity. Please see out terms and conditions. All of our instructors hold surf lifesaving and SUP instructor qualifications. They also complete in house training to ensure best practice and that they are teaching to the high standards that we demand. They are qualified first aiders and have extensive knowledge of the areas that we operate in. We are licensed by the Adventure Activities Licensing Service ensuring that we meet the highest standards of safety and best practice. This is our 24th year and we have an excellent health and safety record. Can I wear glasses during the activity? We do not allow glasses to be worn whilst paddling out or in through surf or close to any obstructions. It is preferable to wear contact lenses or prescription goggles because of safety issues. Yes of course – there are viewing points at most locations. However if we are off on a tour viewing may become restricted. Yes! You can burn even when it’s cloudy! We ALWAYS advise that you use a factor 30-50 water-resistant sun cream before taking part in one of our activities. Yes of course – we recommend booking a series of lessons if you really wish to learn the basics or improve your skills. How do I know which class to book? Please refer to our “What level of SUPer am I?” in order to choose the most appropriate class for you. Can we book the Monster SUP Adventure? Yes of course, we can take a max of 6 adults or 10 children per monster SUP. If you have a mixed group and are unsure then please contact us to check. Is there anywhere for refreshments nearby? Yes there is a catering van “Food for Thought” located in the car park during the main season and there is also a variety of pubs, restaurants and bakeries in the immediate area. Are there toilets at the beach? Yes Harlyn is one of the few beaches in the areas that allows dogs.